The most commonly used portable air conditioner, also known as a spot cooler, operates on standard power (115 Volt AC) and are rated at or around 1 Ton. 1 Ton of air typically cools a 400 square foot room with 10 foot ceilings. One ton equals 12,000 BTU. For a description of BTUs and how cooling works, click Portable Air Conditioner Basics. Most customers use portable air conditioners whenever they have a short-term need to cool a space while their primary air conditioner is being repaired or when they need to cool an area that is too hot. That’s where 1st Cooling comes in! 1st Cooling provides effective climate control all over the US through our locations and network of companies. Portable air conditioners also dehumidify the air. The moisture removed from air molecules by the evaporation process is called condensate. The condensate is usually collected into a removable 5-gallon container inside the spot cooler. The container needs to be dumped one to two times each day (sometimes more) depending upon the humidity level in the space you are cooling/dehumidifying. From commercial office spaces to industrial warehouses, hospitals and health care facilities, and server rooms, 1st Cooling will assist you in deciding which model best fits your application. Rent and cool your space using a Portable air conditioner. We provide emergency cooling, spot cooling, or supplemental cooling where and when you need it. The units can also be used outdoors for spot cooling your party or special event. The Model 1SKK-1411 air-cooled portable air conditioner is perfect for cooling spaces around 400 square feet with a 10-foot ceiling. 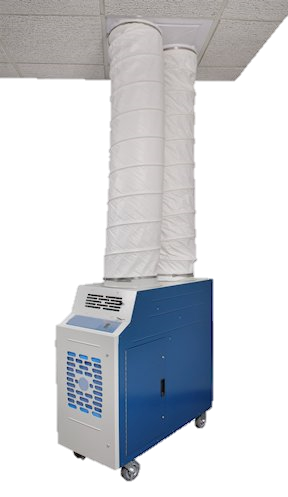 The 13,700 BTU/hr spot cooler only requires a standard 115 Vac receptacle. 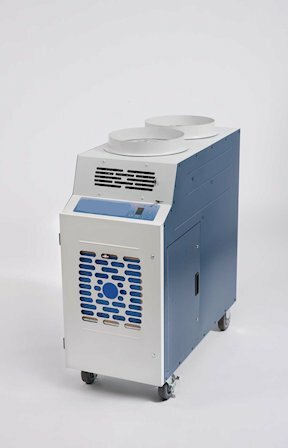 air-cooled portable air conditioner is a ‘true’ air conditioner since it uses a dual-duct system for the cooling process. This portable air conditioner is perfect for “tight” rooms such as a small computer room or telco room where you need to pull outside air to cool the condenser. Cold Air Supply Nozzles (Y/N – Qty – Dims): Y / 2 each x 5″ dia. Portable air conditioners are also dehumidifiers since they remove moisture from the space. Buy a portable air conditioner as a back-up cooling system in case your ac system goes down or if you have hot spaces in your building. Portable air conditioners also dehumidify the air by removing moisture from the space.